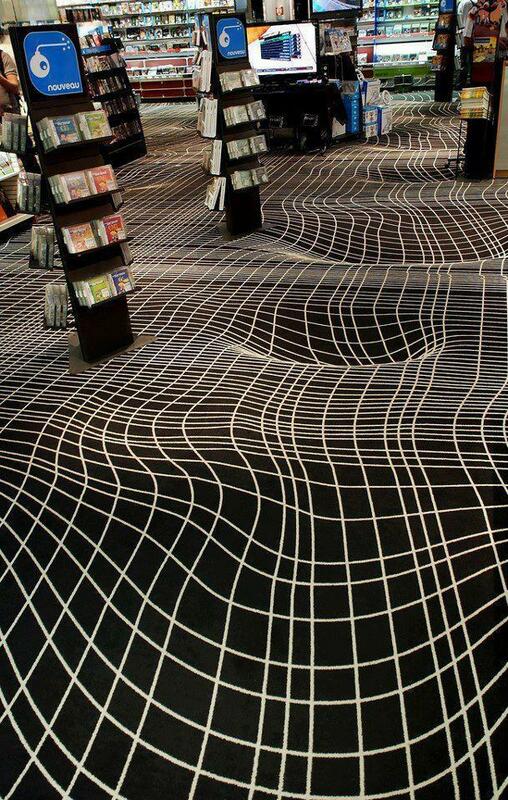 The Curvature Blindness Illusion Strikes! Optical illusions are puzzles for the eye. They reveal how different combinations of images — light and shadow, shape and density, foreground and background — can trick viewers into seeing something unexpected. And we are still discovering new illusions that deceive and delight us. In the above image, pairs of wavy lines run horizontally across the screen. In the white and black corners, they’re fine. But in the gray area, half of those wavy lines suddenly look like zigzags. The only difference? The alternating pattern of light and dark patches on each line. In lines where the peaks of the waves are dark and the valleys are light, the wavy pattern remains. But when the dark and light patches are the ascending and descending parts of the wave, our eyes interpret them as lines forming corners instead of wavy lines. 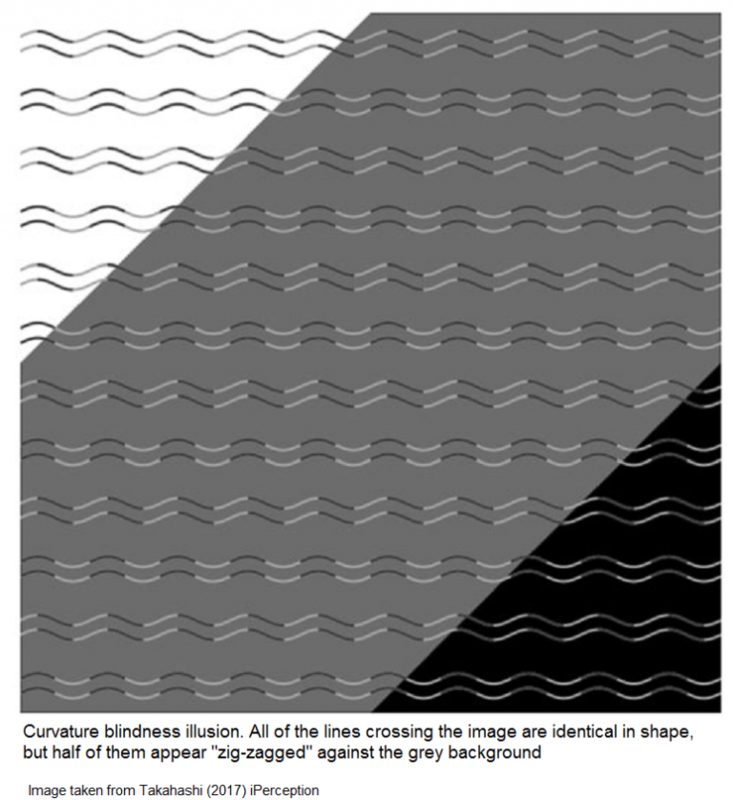 This is known as the curvature blindness illusion. As with many optical illusions, this is all about contrast. The white and black backgrounds allow you to view the alternating pieces as one continuous wavy line, whereas the gray background forces you to regard those alternating pieces as individual segments. Those individual segments are granted the illusion of three-dimensions, and our minds process the lighter ascending line and the darker descending line as “walls” forming a corner, rather than the rising and falling of a sine wave. It’s amazing how distinctly different the pairs of lines look with just those small variations. Even knowing how I’m being manipulated, it’s still hard to convince myself that I’m not actually seeing what I’m seeing. 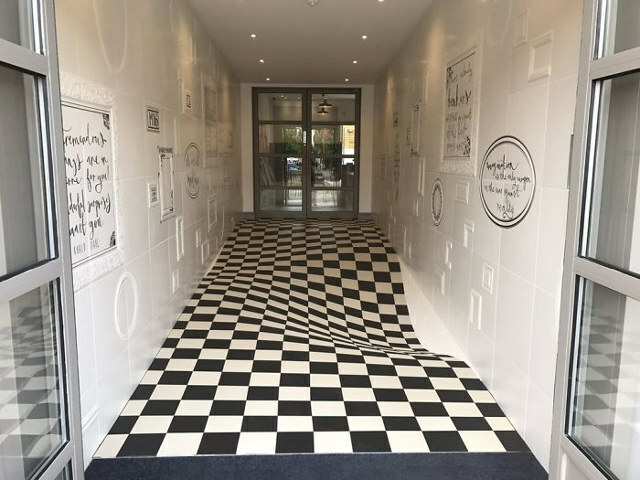 I’m a huge fan of optical illusions and visual trickery. From trompe l’oeil paintings to the works of M.C. Escher, these pieces are sources of wonder, employing forced perspective and visual sleight-of-hand to create impossible objects and images with unexpected depth. Essentially, they’re visual puzzles, left for you to sort out and examine at your leisure. 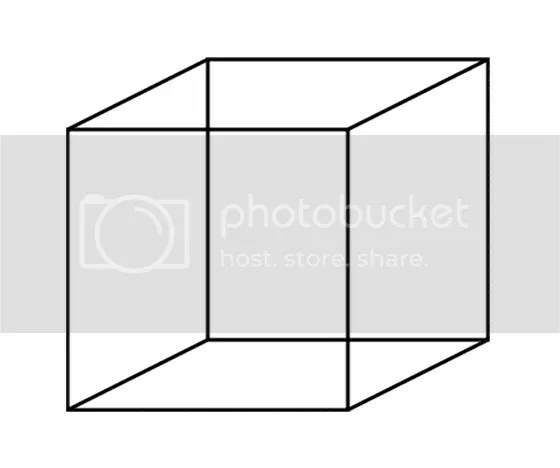 One of my favorites is also one of the simplest examples of multiple-perspective imagery: the Necker Cube. As you can see, the Necker Cube appears to be in different configurations, depending on which part of the cube your eye interprets as facing you. By focusing on a different spot, the perspective shifts, and suddenly the cube is positioned differently. My eyes twitch a little just looking at it. It’s fascinating stuff, a perfect reminder that puzzles can be wordless and lurking in plain sight.